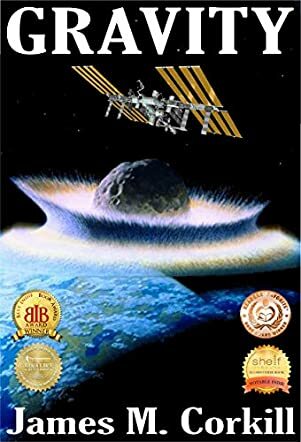 Gravity by James M. Corkill is the fourth installment in the Alex Cave Series, a throbbing sci-fi with a gripping plot. Geophysicist Alex Cave has just been informed by the Director of the Nordic Volcanological Center about an unusual volcanic occurrence in Iceland, where huge blobs of molten rock float out of an ancient glacier. With his friend Okana, Alex sets out on an investigation that uncovers a 180-million-year-old alien artifact, but it is stolen by Janice Sloan, who demands $2 million in exchange. Things get even more complicated when Sloan abducts Alex’s girlfriend and her ten-year-old daughter as part of her ploy. But something worse is happening — an emerald asteroid is on course to collide with the earth, and there are only six days left until the impact. A lot is happening in this sci-fi novel that features blackmail and kidnapping, as well as a man’s desperate race to save the earth and those he loves. Alex is a well-developed character, a man facing multiple conflicts at the same time. Readers will love the characters in this book and the author’s writing voice — strong and clear. Although I have not read the previous books in this serious, I was able to connect with the story and the characters without any need for much backstory, thanks to the author’s gift for intelligently weaving elements from his previous book into the new one, without distracting the reader. The plot is fast-paced and it has many surprises for the reader. One has to read on, eager to know what will happen to the ancient artifact and if the asteroid will collide with the earth. Gravity by James M. Corkill reads wonderfully and I loved the originality in plot and characters.